Launched for Summer 2013, the China Glaze Sunsational collection is made up of six jellies and six cremes, all brights leaning toward the neon spectrum. And today I bring you three of the jellies of this collection! If you follow my blog, you know that I simply love jelly polishes. I love jelly sandwiches, I love jellies on their own… there is something about them that I can’t get enough of. They are like the lipgloss of polish, providing a wash of colour that you can intensify… or not. The first polish is You Drive Me Coconuts, a hot pink/fuchsia, almost violet jelly with an amazing formula that veered just left of full coverage. It was almost more of a crelly, a cream-jelly. I used only two generous coats for the photos, with base and top coat. The finish was not as shiny as I like, it dried a little satin, hence the top coat, but the colour was bright and gorgeous! The next shade, another pink, is Heat Index, a more salmon-coral hot pink. Heat Index was extremely sheer – you could almost use it over a French manicure for a wash of colour at one coat. I didn’t want to keep layering, so here are three coats, with base and top coat, and you can still see a lot of VNL (visible nail line). I actually liked this look as I find the sheerness makes neons like this more wearable and softer, and I LOVE this shade! The final jelly shade I have is Keepin’ It Teal, a light turquoise that actually applies more green. This one was very sheer, so I thought I would layer it over a base coat of white to see how it would fare. It looks like a pale mint on the two left nails, over white, and still quite sheer on the ring and pinky nails. I think this was my least favourite of the three – I had hoped for more turquoise – however, this will make an amazing jelly sandwich polish! Below are two coats with base and top coat. Have you tried any Sunsational Neon jellies, and which is your favourite so far? China Glaze nail lacquers are available through salons and professional beauty supply stores nationwide. 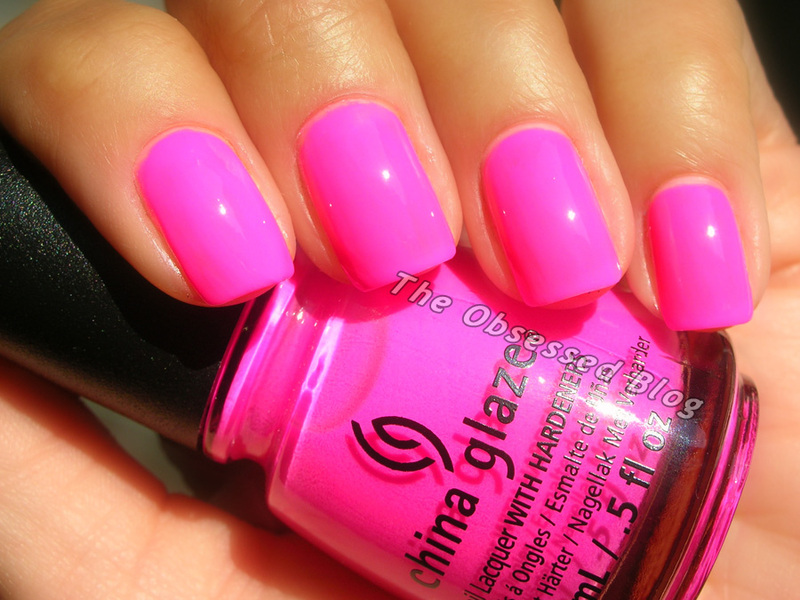 For more information, please visit http://www.chinaglaze.com or follow China Glaze on Facebook, Twitter and Pinterest. Wow the turquoise looks so different over white! Aw thanks! There are some gorgeous shades in this collection for sure. I love Shell-o! I think I NEED Heat Index! Hahaha, I know, they’re bright! I just love China Glaze !